This is an excellent lawn mower. I've had it for six months now and I have no complaints. I purchased the mower from Lowe's for $240 plus tax. I also had a 10% off coupon for being a new homeowner . It comes from the store pre-assembled and out of the box you can be mowing in no time at all. It even comes with the oil. The large back wheels make navigating hills and turning very easy. My yard is quite hilly so this was essential. The plastic comfort-grip bar that you hold down to make the mower mow is quite comfortable to hold and has not yet given me any blisters. The engine is a honda which as far as I am concerned is the best engine you can buy. The bag is high enough off the ground that you are not constantly dragging it and is easy to empty. I read that Troy-Bilt's mowers with small back wheels had problems with bags dragging and eventually tearing. You don't have to worry about that with this mower. Its light weight also makes it easy to push even up really steep hills. I have noticed that when you turn the mower rather quickly, it sounds like it is about to turn off. I am sure this is just sloshing of gas, or a safety feature to turn the mower off if it flips over. It has never actually turned off and has never caused me any problems. I would certainly recommend this mower. Bought lawnmower from neighbor who was moving to condo. Mower worked for 5 mows, then started to stall. After letting it sit overnight, would start up and run for 30 seconds, then die. Now that's all it does. Won't restart unless it sat for a while. About to remove carb and do a cleaning and put in new gas. what a pain. Any thoughts? I bought mine in 2006 or 2007. I had one problem the first couple of years; hard to start. Then one day the cable to the engine brake/idiot handle broke, and I improvised with a small C clamp to finish the job. I found out it cranked great when the engine brake was REALLY off, and it has ever since. Love the big back wheels, the adjustable height at all four corners, and the superb mulching ability. I'll never buy another side discharge. The clippings just disappear into the lawn, which can only be good for the soil (and the grass by extension). Still going strong in 2014. Way to go Honda and Troy Bilt. It consistently starts with one pull. Enough said? 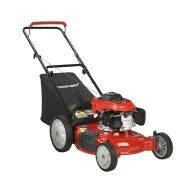 I have used mowers with Briggs engines and with Honda, and I can tell you that Honda is far superior. It is not even close. I bought my Troy-Bilt Model 11A-542Q711 mower equipped with a Honda GCV160 Engine from LOWE's on 3/24/07, over 5 years ago. It has been virtually trouble free up until recently, over 5 years after I purchased this mower. The recent problem was the carburetor. I merely replaced the carburetor, Honda part number 16100-Z0L-853, for less than $25.00 and it runs like new again. If you do not have a local Honda small engine parts dealer you can find these on eBay. Just be forewarned that the prices vary greatly on eBay for this carburetor. To install a new carburetor you will need 5 gaskets also. The carburetor & gaskets are the ones for my mower. It is very possible that yours would not be exactly the same as they can vary by your engine serial number. maintenance schedule. (1) Use only PREMIUM high octane gas (2) Never use gas that is over 90 days old (3) Make sure that your gas is very clean and contains NO debris or contaminants - NOT even just a little bit (4) Completely drain the gas from your mower at the end of each growing season & run the engine until the carburetor & lines are empty. Discard any gas in your mower gas can. (5) Use ONLY a FULL SYNTHETIC oil of the brand of your choice in your engine. This engine only holds a total capacity of 18.5 ounces not much over 1/2 a quart. Change your oil at the beginning of every mowing season. (5)Keep a NEW replacement air filter cartridge on hand & replace it when it becomes dirty(6) If you have the same engine as I do instead of using the recommended spark plug, an NGK brand BPR6ES, upgrade to an E3 brand Spark Plug. My mower uses an E3 part number E3.18 - Note: E3 brand spark plugs are expensive at about $7 each but I have found them to outperform & be SUPERIOR to ALL other Spark Plugs. You will see why when you look closely at the electrode. If you have a lawnmower of any brand that frequently fouls spark plugs. cross your current spark plug to the correct E3 Spark Plug and I am confident you will see a real noticeable improvement. E3 Spark plugs can be bought at a number of places including Advance Auto Parts stores. I hope my comments will help each of you in some way. Starting last year I have seen more carb. problems than ever before. I think the percentage of ethanol in the gas is higher than they are telling us. I tried buying gas that was supposed to be ethanol free, but guess what...its not, it tested at 7 percent. Now I as using a product that is supposed to correct this problem, there are several products on the market so just pick you one. i have had this mower for three years. no problems. you need to turn the gas off two minutes before running it to the end. it will then sit with no gas in the carb. works great. keep the carb clean. I've got the Honda 160cc on my TroyBilt. (It looks a little different than the picture with a 4 speed knob in the middle of the handle. I bought it from Lowe's as a previously returned unit. I've owned it for three years and I like it just fine. I drain the tank in the fall and run the gas out of the carb. I store it in the shed here in Chicago. It starts every spring with fresh gas. Never any trouble starting it. The idle was a little slow and rough this year. I used carb/choke cleaner and sprayed the crud away from the linkage. Problem solved. This is a good mower. Purchased Troy-Built 160 cc Honda frrom Lowes. I used it for 4 months. Used premium gas I put in my Mercedes. It wouldn't start, went to web site and was told to replace spark plug. Bought spark plug at Lowes but it didn't fix it. Returned it to Lowes 11-17-11. Today is 1-15-12 and they still have my lawnmower. They said carb gummed from bad gas which is my fault and the manufacturer won't cover it. I said that was unacceptable. They've now offered I go get it fixed myself, bring back receipt and they will give me $100. I was told a new carb is about $87. So I find that is unacceptable. I feel Troy-bilt, Honda and Lowes should be held accountable. Do not purchase this engine. I am fed up with lack of corporate ethics and usery. I love sites that allow the truth to be heard and spread, thank you for tools that help (no pun intended). Don't want to jinx the thing but mine has worked great since day one- completed 2 summers. Miles quieter than a Lawnboy. Starts first pull and never quits on me. Bought in Canada from Can Tire for great price and runs great on reg. gas. Sounds like a US ethanol gumming issue for all these complaints re: stalling. I agree with all the "single stars". I purchased this mower about four summers ago and it has worked for the first summer. Purchased from Lowes, returned there for repair, got it back worse than before. Took it to two local small engine repairs, got it back each time it ran for a few weeks then wouldn't run after starting. Gas was emptied at end of each summer. Start the next year with the same frustration of not running after first engine firing. I would love to keep the body/frame if I could replace the motor. It's been basement/shed kept since purchase. Any motor/carberation recommendations. Any recommendations!!!! I have spent as much and more than what I paid for it. Will try this for recommendations before purchasing a different mower. Troy-Bilt you should be ashamed. I just went on the internet to see what brand and type of oil are recommended for this unit, and was astounded to find all the bad reviews. I have had ZERO problems with the engine in the 5 years since I bought it. I just used it about 20 min. ago, and it started on the first pull after sitting for a month! (yeah, I know, 5 years is too long to wait for an oil change) I grew up using small engines, and the fact is, they are ALL prone to fuel problems because of the small jets in the carb and typical intermittent use. All I can do is relate what I do to address it. I always use a small can and go get fresh gas in small quantities. There is a local station that sells methanol-free gas, which is better. I use a CLEAN container and CLEAN funnel, and use a brush to remove all the fuzz from around the mower gas cap before removing it. A shot of Sta-Bil in the container helps keep it and what's in the tank fresh over the mowing season. I add more when I get gas. The best maintenance is PREVENTIVE maintenance. I learned that the hard way! Premium gas probably has better additives to prevent rust and gumming, but isn't needed because of octane in this engine. Using premium might replicate what I do with the Sta-Bil, haven't tried it. At the end of the season, I put extra Sta-Bil in the tank (about 1 1/2 or two capfulls) and let it run out. A spring type woodworking clamp works great to hold the blade brake handle. There is also a bowl drain on the carb. Make sure ALL the gas is run out. Just my two cents on the fuel problem. This mower does tend to collect a lot of clippings on top of the deck. I always mulch. I have to maneuver a lot, so I removed the pesky "foot protection flap" at the rear of the mower. Otherwise, it's been a great machine so far, works for me. i have this mower it is on my sidewalk with a free sign on it . poor running , poor performance and i am tired of tinkering with it. as of right now i csnt find anyone that has the sparkplug , not sure that would even help. This is a terrible mower? I have not been able to keep it running after about 40 hours use. Actually, this is my second of this model, I threw such a fit with the last on Lowe's replaced it. I think I am going to try to by a 20 year old one at a garage sale, they used to last for years. One technician told my the epa (socialistic, communistic org) has put such controls due to trying to make them with low emissions that you cant keep the mower running. Never use old gas, never buy new!! I have had the Troy-bilt 160cc for a year and some. tired of tinkering with it. free to junker. How many times it will be used in a year? Less than 20 times in general. If it breaks within a year, that's junk, and that's what I bought. I HAVE THE 11A-543Q711 WITH THE "HONDA" ENGINE AND GUESS WHAT? SAME PROBLEM WITH THE CARB.GUMMED UP,FROM OUR FAMOUS 10% ETHONAL. GO FIGURE,NOT THE MACHINE IT'S WHAT YOU PUT IN IT. BECAUSE THE ENGINE IS A "HONDA" THE KIT COST TWICE AS MUCH!!!! I have the same mower and it stalls shortly after it is cranked. I went through the carb and it is clean. I put a timing light on the plug wire and it looks like it is losing spark when it shuts down. Looks like a magneto problem to me. Bought my Troy Built 160cc mower 4yrs ago. At end of last year I noticed mower would not continue to run unless chock was closed.This year I started mower fired up on first pull, walked a few steps and mower stalled. Mower will no longer cont. to run. Fires up everytime but stalls as fast as it starts. Any Ideas? Disassembled carb and cleaned throughly with special cleaner . . . fresh premium fuel in the tank . . . finally got the mower running after many pulls (needed to play with the throttle spring and hold the choke almost fully open) . . . needed to tape the choke almost fully open while mowing in order to keep from stalling out . . . this was a few weeks ago. Today I go to use again but it starts and stalls . . . I can't keep it running . . . approximately 40 hours of use . . . this mower is junk and should be recalled given some of the other reviews I've read! I've had this unit for one year. I'm now having same issues with low power and the need to partially choke the engine to keep it running. Now it won't start. I bought this unit "reconditioned" as new from Lowe's and the service bill which came with the mower stated "Inspect, will not start. No compression. Pulled head and free up stuck intake valve. Rebuild carburetor. Service engine and test run. So much for the Honda small engine reputation. Geese, you'd think it was a Toyota. We are having problems similar to those reported by other users . . . we have had the mower for a little over 2 years and its been used 40 hours tops over that period . . . the engine is either starving for fuel or getting too much fuel (but most of the time it is starving for fuel) . . . we adjusted the throttle spring and got it to work for an hour but the same problems returned the next time we attempted to use . . . we cleaned the carb and got it running for a couple minutes but most of the time it starts and then coughs a few times before stalling . . . the carb on this thing is not adjustable and I think its junk . . . I've been using lawn mowers for 30 years and have never had one give so much trouble as this one . . . our Lowes warranty expired and they won't do anything . . . I will contact Honda and see what they say. Have had my Troy-Bilt TB-130 for 2 years. No problems. Always starts on first pull. The sound of a Briggs & Stratton is nice, but this Honda engine has me sold. Thanks for the advice on the fresh gas! Set up was clear and simple. From opening the box to cutting first blade of grass took 10-15 minutes. Light, handles easy, cuts evenly, starts well w/ Honda engine; Well made; solid construction. Broke after 20 month and lowes can't fix it. It either floods - gas pours out of carb or it starves for fuel. If you cut across a hill one way it runs ok when you go back the other way it quits or runs poorly. Sound familiar? Will try to see if there is a differant float/needle assembly available. I would appreciate it very much if one of You could send Me a e-mail explaining how to and what the gap setting is for adjusting the valves on a mower like this.I am having severe gas problems with this mower.So I am doing a maintenance check of the mower before I put it in the shop. Any information You could share would be greatly appreciated.I have a owners manual that does not help much in mechanican. I bought this unit about a year ago. It ran great last summer but this summer I am having a lot of difficulty with it. It seems to have lost a lot of power, stalls constantly, and won't start up easily. I guess that this mower is really picky about having fresh fuel. It run good for a summer and by the next summer started to not run unless the automatic choke was closed up somewhat and to increase closing the choke or else it would not run then it quit and is fairly new. Still don't know the problem. Know how to do maintenance but no luck. Why would it do this? My 160cc engine has lost power, all the basic changes haven't helped. Mower has been well kept and stored, fouls spark plus faster than I can replace them. Hoping to find the problem soon as I do like the machine if I can get her back the HP. I'm happy you had good luck with the Model 540 Troy-Bilt. I just posted my bad luck with this unit. The first mower would not start. Lowe's exchanged it for an identical unit that started on the second pull. I busted my knuckles trying to adjust the front wheels. WD-40 didn't help. After 1.5 hours of use all four wheels would barely turn. I do have some sandy spots on two vacant lots I mow. Had to remove and oil all 4 wheels to get them to turn freely. My old Murray mowed these lots for several years with no problems. Sorry the Murray died. I bought the Troy-Bilt this past summer when my old mower cut out on me (no pun intended). Anyway I was in need of the new lawn mower and did not want to get one that may be just a one season deal. I have a fairly small yard which makes the size of this mower perfect for moving around the yard easily. I used the mulch feature this past summer which was a huge bonus! I think it really did wonders for my lawn! The only issue I have with it is that sometimes I have had a hard time getting it started, but that is probably just my unit, and my brother in law is going to look at it this winter before we get into the spring and grass cutting season again. And if he can figure it out I have a 4 year warranty which came with the unit, I believe which is standard from Troy-Bilt. Absolutely I would recommend this mower to anyone looking for a sturdy mower that should last you at least a couple years, it can come in very handy when you need to clean up the yard for company, or as it did in my case, when I got back from 3 weeks on the road for work and my lawn was nearly up to my knees, ha ha. So to kind of sum this up, it?s a great mower; I paid about $350 CDN for it at Canadian Tire, for all those fellow canucks out there, defiantly a great deal for me anyway!